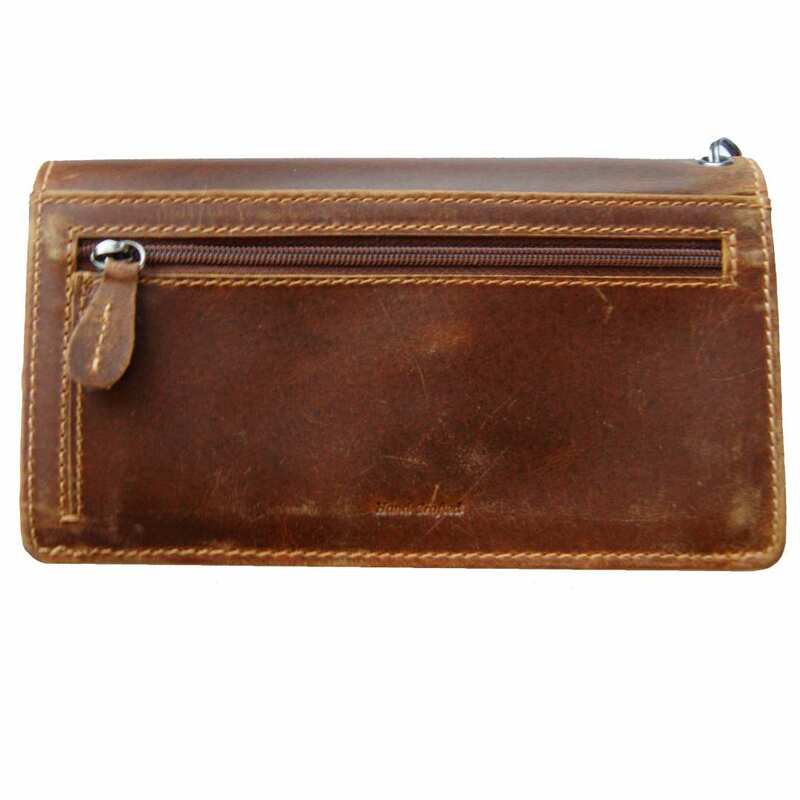 Product information "Chain wallet ROCKEFELLER of brown leather"
The chain wallet ROCKEFELLER made of brown leather is a very handy and spacious option to carry money, the ID card and the shopping list safely and stylishly. Would you like to have a money purse that provides enough space, is made of robust high quality and will be trendy even in five years? 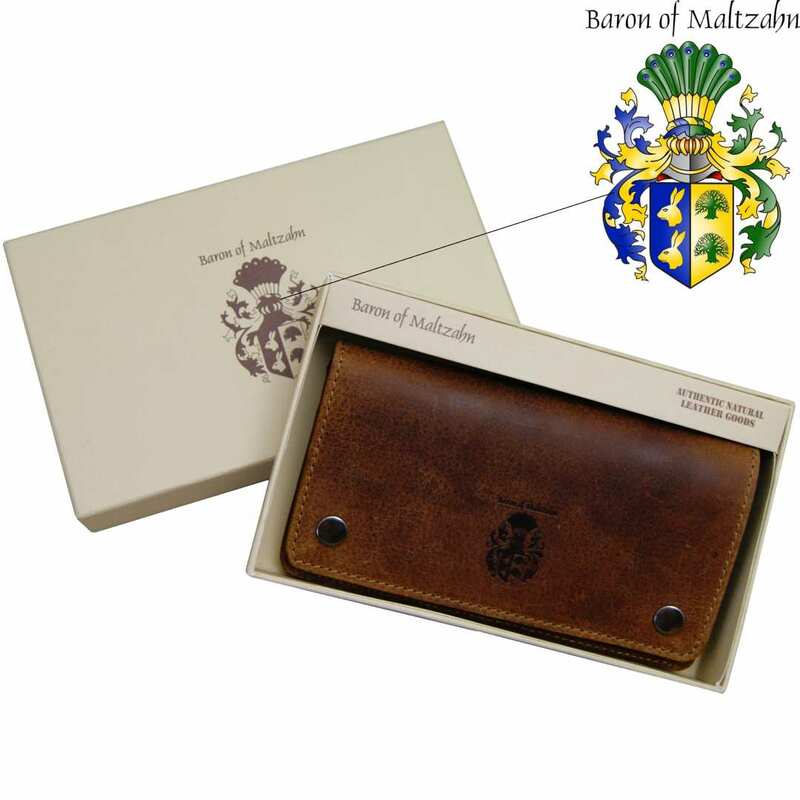 Then the wallet made of brown leather is made for you! This discreet chain wallet is a functional and very resistant companion that will always be fashionable. The various compartments are perfect to keep money and cards well arranged, so that you can find quickly what you need while shopping. The handy natural leather is soft to the touch and will get a beautiful and fancy old, used look over time. 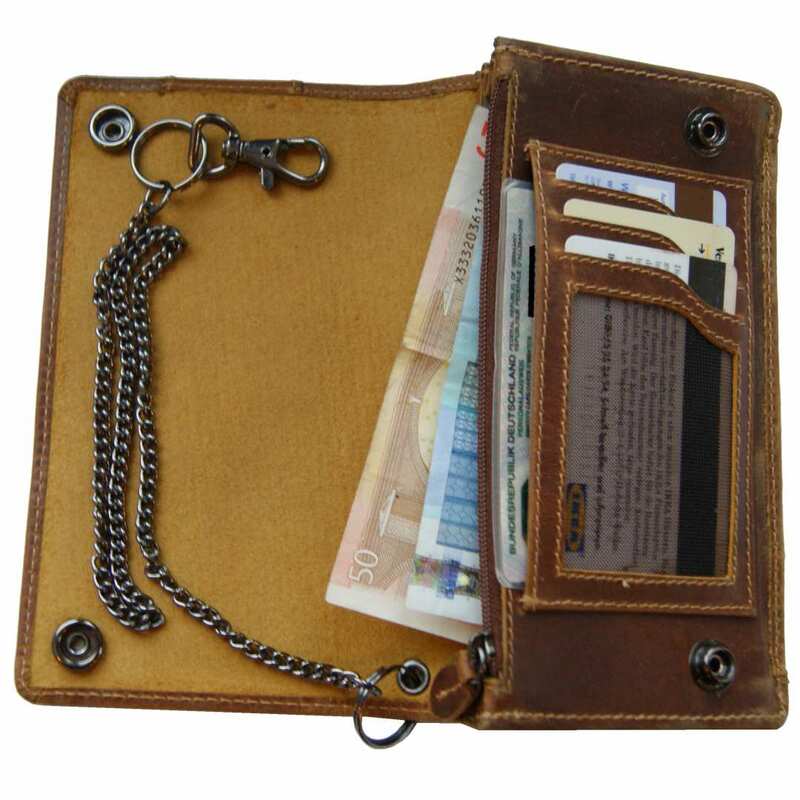 The wallet made of brown leather is provided with a solid, detachable chain with a carabiner that can be easily fastened to the trousers or a backpack. That way, your money will always be where you want. The total dimensions of the wallet are 7.1 x 3.9 x 1.2 in. On the inside of this article, you can find three compartments for bills, one section for your ID card, one big zippered pocket and three card holders. Just close this section with both nice and useful buttons to avoid something falling out. On the back side, another zippered pocket enables the quick access to coins or tickets. 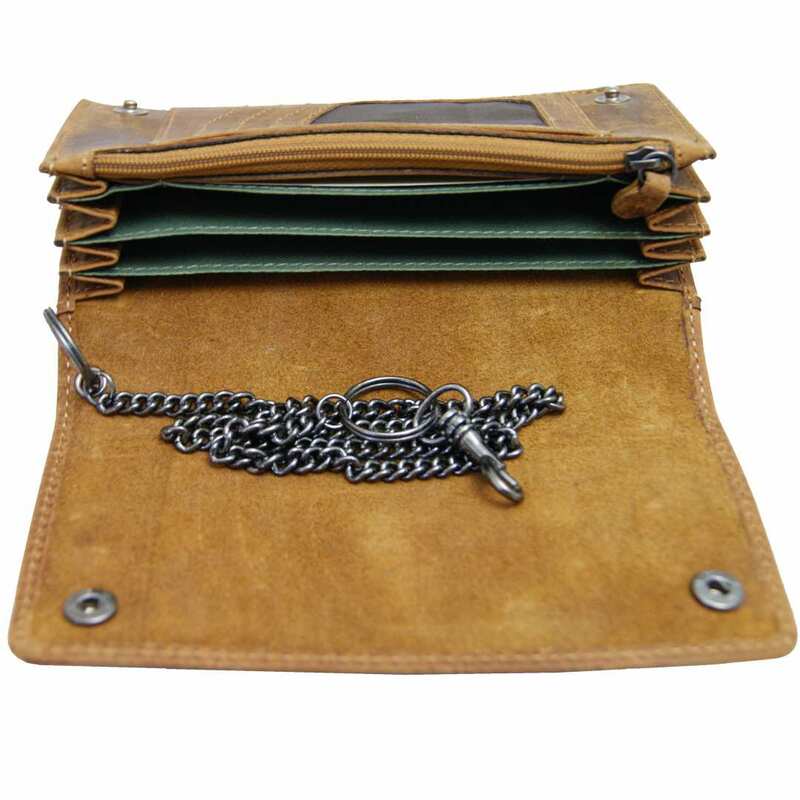 The wallet is made of high quality natural leather. The flap is covered with a soft light brown leather lining, whereas the inner compartments are provided with a protecting, smooth, gray cotton lining. The purse is sewn with extra strong thread which suits the color of the leather. This article is finished off by valuable metal fittings. The quality cannot be better! 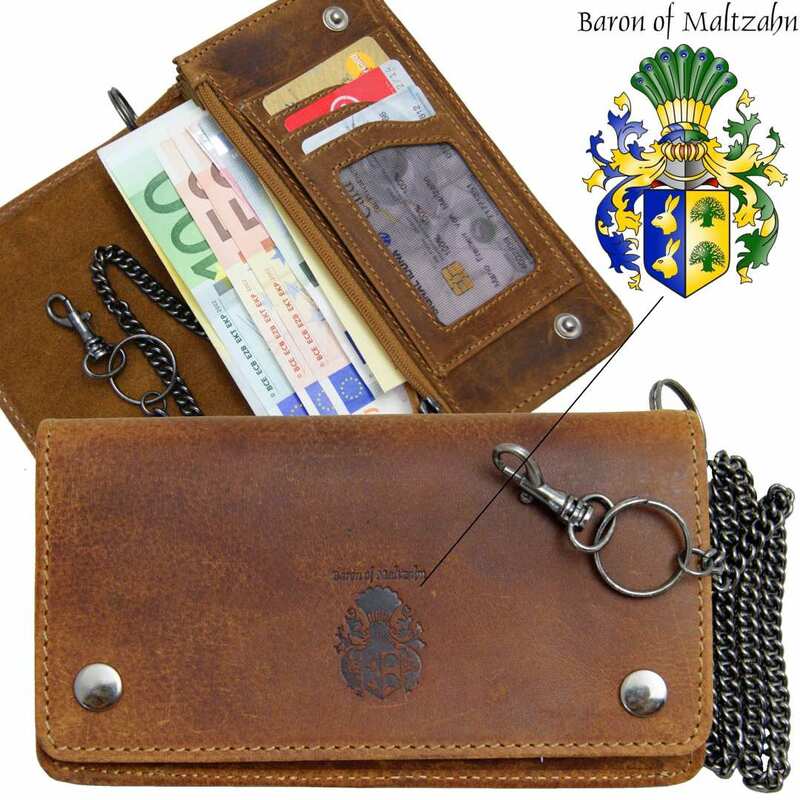 Reviews for "Chain wallet ROCKEFELLER of brown leather"